Whatever you may think of the TripAdvisor site, there’s no denying that it’s good to see Bristol-based businesses getting great reviews. The latest success story is pizzeria A cappella on Wells Road, which has recently been judged the top pizzeria in the UK based on the reviews and opinions of TripAdvisor users. Tucked away on the Wells Road, you could almost be forgiven for not giving A cappella a second glance when you walk past. It’s an unassuming building with a relatively small frontage, and a small outdoor seating area…but don’t make the mistake of walking past. During the day, it’s a bustling cafe serving breakfasts and lunches, and by night a busy pizzeria – the restaurant was fully booked on the night of our visit, with plenty of pizzas for takeaway and delivery also being rushed out of the kitchen. The pizza menu is available from 5pm every day, offering diners a choice of vegetarian, meaty or fishy toppings. Flour and mozzarella are sourced from Naples for true authenticity, and A cappella’s pizzas are stonebaked to give a great consistency to the crust. 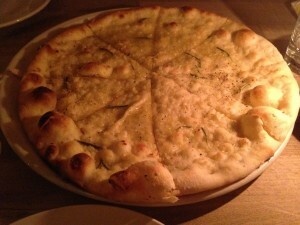 We decided to order a garlic pizza bread (£3.95) to share while we waited for our pizzas…and we could smell it before it even reached our table. Oozing garlic oil and generously seasoned with salt, cracked black pepper and a scattering of rosemary, the base was lovely and crispy at the bottom and doughy and delicious in the middle, the way a good pizza should be. The amazing consistency of the base, we were pleased to see, carried through to the pizzas themselves – we went for the smaller 12 inch “medium” option (14 inch pizzas are also available) but the generosity of the toppings made for a more than filling meal. The other half went for the Fortissimo (£10.45): the same wonderful base loaded with mozzarella, crushed red chillies, fresh green chillies, pepperoni, red and yellow peppers, basil and chorizo ventricella. With the double chillies, it certainly packed a punch (but this didn’t stop him from adding extra chilli oil…), and the quality of the toppings was clear: the combination of flavours was amazing. 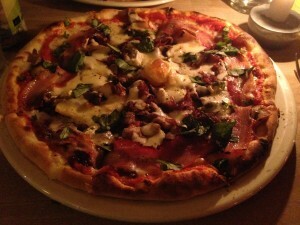 I continued my (apparently controversial) theme of choosing a pizza with a free range egg as a topping, by opting for the Allegretto (£11.45). Alongside the egg (yolk nice and runny, a big tick from me) sat mozzarella, sautéed mushrooms, generous strips of smoked pancetta, caramelised red onions which added a lovely sweetness and – a revelation for me – BRIE. I think after that trip to A cappella, Brie is my new favourite pizza topping, and one that provided a great contrast between the solid rind and the melted centre. 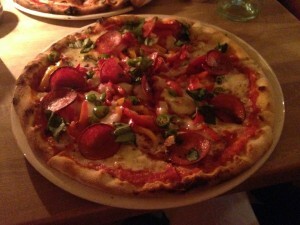 Seriously impressive pizzas – from the base and the toppings down to the homemade tomato sauce, which is definitely the freshest-tasting that I’ve found in Bristol. If you’re local (defined as Totterdown, Knowle, Windmill Hill, Victoria Park, Bedminster, Southville and Brislington), they’ll deliver for a £1 charge providing the order is £10 or more – and you can also order your pizza to take away. If you’re looking for a quiet night out, A cappella may not be the place for you – we were seated very close to the two neighbouring tables which meant that we did have to shout a little – but the atmosphere was warm and friendly and the service perfect. We’ll definitely be back.